This is something I've been wanting to try for awhile, packing lunches on Sunday night for the whole week, and this week, I finally went ahead with it! 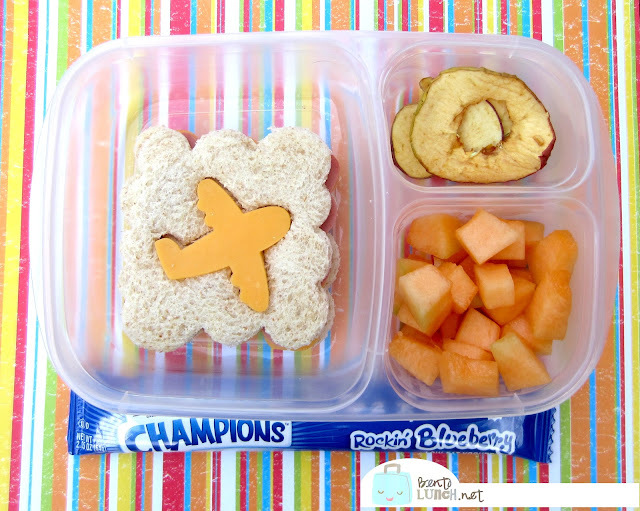 F&B have a 4 day school week, which meshes well with what I hear a lot of people say--pack 4 lunches, pick a hot lunch on the 5th day. 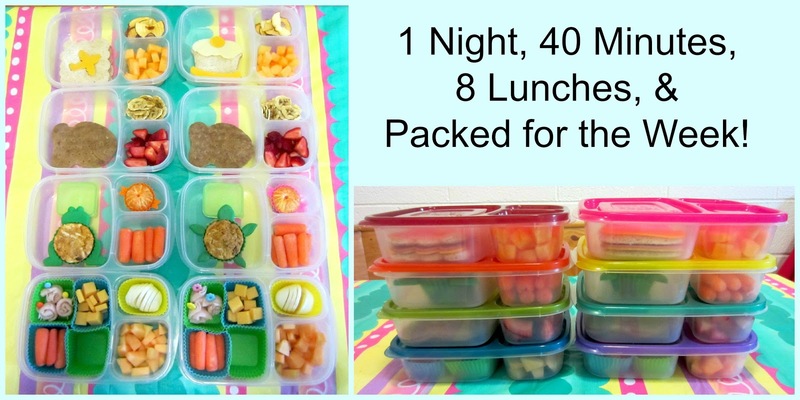 On the other hand, by the time you've packed 4 days of lunches, what's one more? 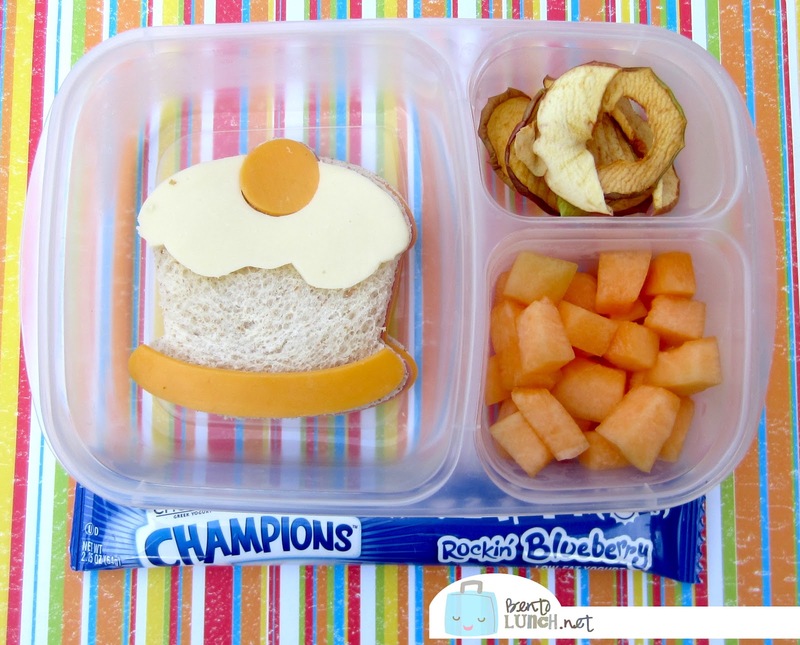 To keep things simple, I used EasyLunchboxes for all the lunches because they stack better in my fridge. I used the classic color lids for Ben, brights for Faith, and rainbow order to organize them. For Day 1, I went with ham and cheese sandwiches on honey wheat bread. Both kids have theirs cut with LunchPunches--an airplane for Ben and a cupcake for Faith, with just an extra cheese cutout for decoration. To go with that, each kid had dried apples, cut up cantaloupe chunks, and a blueberry Chobani yogurt tube. Sunday evening assembly included making the sandwiches and the cheese cutouts. I've been dehydrating apples all week, so those were in a bag in my fridge. I also cut up the entire cantaloupe the day I bought it, so there was no additional fruit prep. Extra time was spent trying to remember where I put the LunchPunches, which were in my coffee cup cupboard and not with my bento supplies. Morning prep included adding the yogurt tube to the lunch bags and filling their water bottles. I know! I love getting up in the morning and just grabbing two boxes! I'd be interested to know how the sandwiches and cheese cut-outs faired by the end of the week? - I have fussy eaters!! Thanks! I am so excited about this plan. If test week goes well, I may be doing it more often. Super Cute! What a great time saver! What size lunch box do these fit in? My kids have the square Pottery Barn ones and I'm thinking they are not going to fit.